This article is an excerpt from the CustomerThink research report Customer Experience at a Crossroads: What Drives CX Success?, based on a study of 200+ CX initiatives in 2018. While industry experts generally agree that customer experiences include all interactions and the resulting customer perceptions, there is more confusion about what Customer Experience Management (CXM) entails. These perceptions were explored with survey respondents, 92% of which were CX team leaders or members. There was emphatic agreement that key elements of CXM include delivering the brand promise and increasing customer satisfaction and loyalty. In this respect, CXM is a new term for loyalty management practices that have existed for decades. Also, everyone agreed that engaged employees were essential to CX success. Of course, CX managers are unlikely to agree that their role is fundamentally flawed because customers are in control! Pragmatically speaking, CXM is not about controlling customer experience, but about making changes that the company can control (processes, employee behaviors, product capabilities, etc.) to influence perceived experiences in a positive direction. While “CX Influence” might be technically a better term, CXM has been widely adopted by the industry, including hundreds of consultancies and a growing number of technology firms. There were mixed reactions to other statements. One of them gets to the heart of what CX is — and isn’t. For instance, 74% agreed: “By 2020, customer experience will overtake price and product as the key brand differentiator.” Taken literally, this statement is a logical fallacy. If CX includes all interactions and perceptions, then it must include price and product. CX can’t “overtake” something it includes. But, CX thought leaders don’t parse it this way. CX is a representation of everything an organisation does to contribute to the delivery of the “end to end customer experience”. CX (as seen from customers’ eyes) includes product/pricing/interactions plus customers’ behind-the-scenes efforts to select, get and use a solution toward their goals. The behind-the-scenes efforts include integrations throughout select/get/use with emphasis on “use” — integrations with various people, environs, hardware/materials, software, and processes. Customer Experience is what wraps around product and price. So, when is an organization not practicing CXM? According to market researcher and CX consultant Dave Fish of CuriosityCX, CXM should not include companies that only emphasize one element such as product or price or customer service — and ignore the larger narrative of what customers are experiencing on their journey. Given the foregoing, it’s no surprise that 69% disagreed that the “primary goal of CXM is to improve customer service” and 65% agreed that “CX initiatives must include products and pricing.” Still, roughly one-third of respondents see CXM in a more limited perspective than experts advocate. Source: Customer Experience at a Crossroads: What Drives CX Success? Furthermore, while CXM may be about “delivering the brand promise,” some brand promises are not compatible with a holistic definition of CXM. Pushing low prices above all else, with little concern for customer satisfaction, is not considered CXM. Ryanair has prospered with such a model, but CX experts are loath to include this as a CX success story. Indeed, no CX initiatives in this study were focused primarily on low prices. In recent years, spurred by the success of Amazon, many companies have pursued making experiences easy or effortless. In fact, “easy” was the top CX attribute believed to drive customer loyalty, cited by 83% of all respondents. But, 76% disagreed that: “To be successful, CXM should just focus on making experiences easy.” While being “easy” is clearly important, it’s not the only thing that matters. And indeed, it’s not a differentiator for “Winning” CX initiatives, as will be explored later in this report. 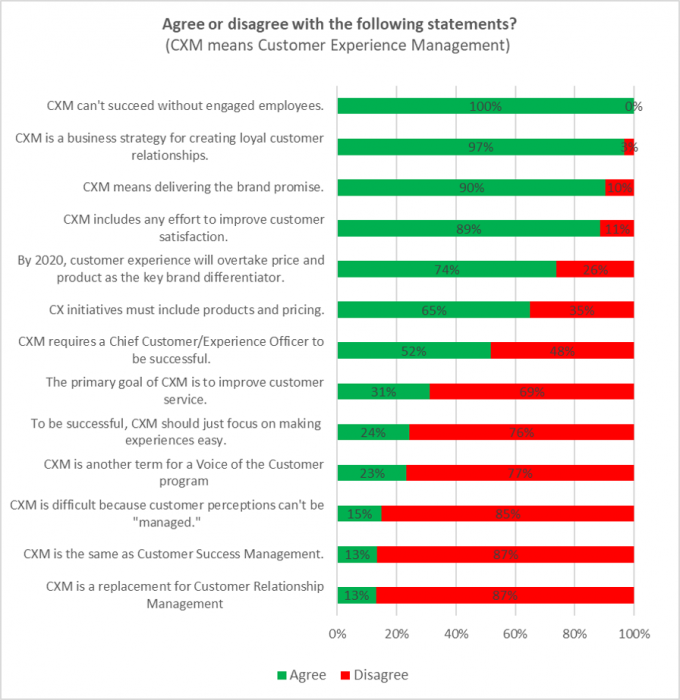 Finally, there was nearly an equal split in agreement on whether a Chief Customer/Experience Officer is required for CXM success. This is consistent with prior CustomerThink research that found a slight majority of organizations believed that a Chief Customer Officer (CCO) would be of benefit to the company, to facilitate cross-department coordination and get support from the CEO and Board. What Does CX and CXM Mean to Your Business? The implication for CX leaders is that key stakeholders may — and probably do — have widely varying perceptions about CX and CXM. Some may think of CXM in a holistic way, but others may believe that CX is just another term for customer service, process improvement, or customer surveys. Furthermore, CX leaders who present CXM as narrowly focused may run into another objection: Why do we need another term for product excellence, price leadership, or customer service? CXM should bring new thinking and value to organizations, not be used as a new trendy label for existing activities. Differentiate CXM from Voice of Customer programs, customer service, etc. Otherwise, according to one Vice President leading global CX efforts at a large technology firm, the tendency is for people to jump on immediate problems without stopping to think and analyze the key business issues that, if solved, would make a significant difference in performance. 1. 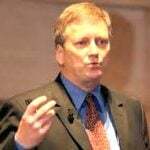 Does Customer Experience Management include Products? Pricing? 2. CXM! What the Heck is That? 3. Ryanair: Low Prices + Unhappy Customers = CX Success Story? Circling the wagons with all key stakeholder groups to identify needs and value drivers, and integrating their inputs on an enterprise level to define CX scope, is an excellent foundation for CXM. That said, we’ve encountered few companies progressive enough to do this on a disciplined and continuous basis. One of the key stakeholder groups often absent from CXM, or poorly represented, is employees; so, glad to see high agreement re. their inclusion. Enterprise-level linkage of CX and EX is crucial. There have been a number of professional and academic studies, in multiple industries, linking employee attitudes and behaviors with the value customers perceive in their experiences.. Through targeted research, and resultant training, communication, process, and reward and recognition programs, what we define as ambassadorship formalizes the direction in which employee engagement has been trending toward for years. Simply, the trend is optimizing and connecting employee commitment to the organization and its goals, to the company’s unique value proposition, and to the customer. This creates a state where all employees are focused on, and tasked with, delivering customer value as part of their job description, irrespective of location, function or level. Hi Bob, this is an important research report, differing from most sponsored research, in that the questions nor interpretations had no bias toward a certain solution set tied to a sponsor. The scrutiny of “just what is what — and why — and does that make sense?” is refreshing. The finding of “emphatic agreement that key elements of CXM include delivering the brand promise” is pivotal. When a reader stops to think about how a brand promise is perceived by a customer (and think about how it applies to the reader as a customer of other brands), it becomes clear that implications from a bundle of things conveyed about the brand (the advertisement, the signage, the labeling, the word on the street, and past experiences with that brand and category) must play-out as the customer expects. Otherwise the sure result is dissatisfaction and poor experience, probable negative word-of-mouth, and possible defection to a different provider. Hence, whatever the advertisement, signage, labeling, word on the street, etc. emphasize must be delivered upon. In most cases, that goes well beyond interactions. And in almost all cases it surely goes beyond customer service. And of course, it’s much more than a loyalty program. I’ve come to appreciate that true customer experience management is alignment of the company with customers’ expectations. Get a clear and more clever understanding of what your core customer segment’s goals and expectations are, and you’ve cracked half the code. The other half is alignment: (a) to continually educate 100% of your employees (and alliances, channels, suppliers) about customers’ goals and expectations, (b) helping them integrate those insights into their daily decisions, (c) preventing recurrence of mis-matches in expectations and what’s delivered, and (d) creating new value by anticipating customers’ reactions and applying creativity toward customers’ goals. The companies we most admire for consistent customer experience excellence are doing that. Most were founded with a very clear “intentional customer experience” northern star, that has guided every aspect of how they set up their companies and how they manage everything. Given that, I agree with your point that it’s important for CX leaders to “clearly define the organization’s intended experiences.” Still, I’d elevate that idea one more rung, by saying it’s important to clearly define the organization’s intentions. This ties back to strategic vision. If the company’s intentions are to maximize revenue, profit, or shareholder value, those objectives will determine the concomitant CX choices. Will management’s decisions be good or positive for customers? I’m not sure. But there are well-known cases where management has dedicated themselves to those intentions, and things have gone horribly bad CX-wise. (please see 2017 Sales Ethics Hall of Shame – http://customerthink.com/announcing-16-new-inductees-to-the-sales-ethics-hall-of-shame/) So I believe the company’s overall intent or customer engagement premise presents great opportunities, as well as risks. Intentions must be carefully considered, because they color every part of CX. Otherwise, we’re just talking lipstick on a pig. Second, I’m curious that “making experiences easy” or “effortless” received such high agreement (83%) concerning what results in loyalty. On the surface, this makes sense. So did the negatively-sloped demand curve concept and the notion that buying decisions are based on rational thinking. But these models lacked explanatory power for the fact that in some instances, increased prices spurs greater product demand, or that many buying choices are highly irrational. We can thank behavioral economists for debunking marketing aphorisms once deemed rock solid. What I understand anecdotally is that many customer experiences are far from easy for consumers, yet customer enthusiasm for the product borders on zealotry. What explains consumers standing in interminable queues to purchase earlier versions of the iPhone, or customers waiting in line for hours to get breakfast at a San Francisco restaurant (as we did one year, though I forget the name of the restaurant), when other choices were far more convenient or available. I don’t know the answer, but it’s an opportunity for deeper study, and at the very least, these situations suggest that positive CX results from a complex interplay of conditions and forces, and is not solved by maximizing or optimizing a single perceived driver. This article is about how the survey respondents (nearly all CX leaders) and industry experts view CXM. Good news: the majority agree that CXM should be thought of in a holistic way. Bad news: a significant minority do see CXM in a more limited role, as process improvement or customer service. And the question remains: are companies actually living up to their aspirations of what CXM should be? Unfortunately, most are not. CXM as commonly practiced is mostly about process improvement, striving to making experiences easy and efficient. This is a necessary step to remove frustrations, but Winners (those able to quantify benefits) are more likely to also prioritize innovation and human factors. I’ll be writing more about success drivers in future articles.